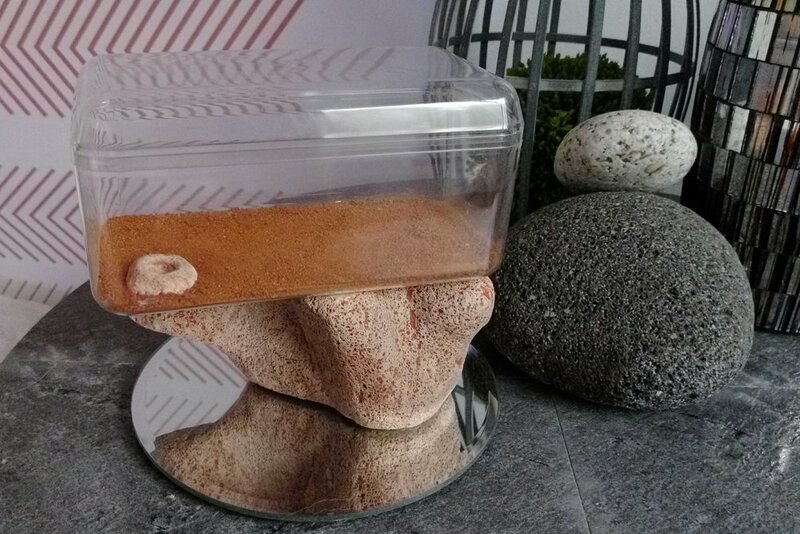 This handmade formicarium was made to look as if it had been lifted from the very earth itself. With fossil like looks and earthy colours and textures it has acquired the name "The Dragons Egg". It's designed with an open display in mind and looks great anywhere in the house. The nest is made complete with two parts. The Dragons Egg has been cleanly sliced on an angle. It opens up to reveal handcrafted innards that any new queen would be proud to rule over in her founding stages and beyond. The acrylic screen is removable which every ant keeper can appreciate as a valuable asset. A neat slow release water hydration bottle system is also set into the top. The Outworld Tree cradles a foraging area which auto locates to the nest entrance with some cleverly positioned magnets. A little Australian red desert sand has been added for the photography but any decorative additions could be placed within the outworld area. With this new innovative design you are able to get your founding queens out of the cupboard and on display with the Dragons Egg & Outworld Tree.